A pirAtti who united and subsequently separated from emperumAn [her sending messengers is highlighted in this decad]. In the first decad, AzhwAr, after having surrendered in 4 decads starting from thiruvAimozhi 5.7 “nORRa nOnbu” and still not having him arrive towards him, thinks “Though emperumAn is having auspicious qualities, being sarvagya (omniscient), sarvaSakthi (omnipotent) and sarvanirvAhakshama (able to manage everything), since the richness of thiruvaNvaNdUr is making him not think of me and since he does not know my state, he has not come; if I inform him of my state, he will come”; since AzhwAr [in the mood of parAnguSa nAyaki] does not find anyone in her entourage to go as a messenger to emperumAn, she goes towards the seashore to reduce her grief; she finds some birds there, shows great love towards them and sends them as messengers to thiruvaNvaNdUr. Meditating upon these aspects, AzhwAr determines that such sarvESvaran should be surrendered unto through gatakas (connectors [AchAryas]), AzhwAr explains how he expressed his state to emperumAn through the entities who have the qualities of such gataka, as a girl [parAnguSa nAyaki] would send a messenger to her beloved consort who is in separation from her. Previously, AzhwAr performed surrender unto emperumAn in four decads starting with thiruvAimozhi 5.7 “nORRa nOnbu” but did not have his desire fulfilled. Though AzhwAr pursued this means [i.e., SaraNAgathi] which is unfailing and instantaneous in producing the result, why did he not have his desire fulfilled? This is because, as ISvara is equally responsible for the well being of both AzhwAr and this universe, from ISvara’s perspective, it is reasonable to delay AzhwAr’s result [to reform the universe, emperumAn is using AzhwAr]. AzhwAr entered many dhivya dhESams where emperumAn willfully and joyfully descended and AzhwAr did not have his desire fulfilled. He then went upto avathArams (incarnations) where one can have close interactions with emperumAn, but since they are in different era, AzhwAr did not have his desire fulfilled there too; and that weakened AzhwAr further. Now, he retracted to dhivya dhESams thinking that there is eternal presence, familiarity and no lack of ability; as such thoughts immersed AzhwAr and stopped him from walking further, hence he falls at the feet of birds and sends them as messengers. The incarnation he meditated upon in previous decad was beyond the reach of messengers and hence he is sending his messengers to thiruvaNvaNdur where emperumAn is residing. The bhakthi AzhwAr acquired was not by his own efforts through gyAna yOgam, karma yOgam etc., but was acquired by the grace of emperumAn. Only those who have some personal abilities and who think “let me become complete on my own”, can be patient to attain the goal and such aspects cannot be attributed to AzhwAr. And the means AzhwAr pursued [i.e., SaraNAgathi] cannot tolerate any delay! There is significant difference between this upAyam (means) and other upAyams. One who pursued such upAyam will not be patient; that is why, out of great grief, he is sending a messenger to emperumAn to inform about his state. AzhwAr is not of the nature to think “After surrendering, we shall be patient until emperumAn bestows the result”. 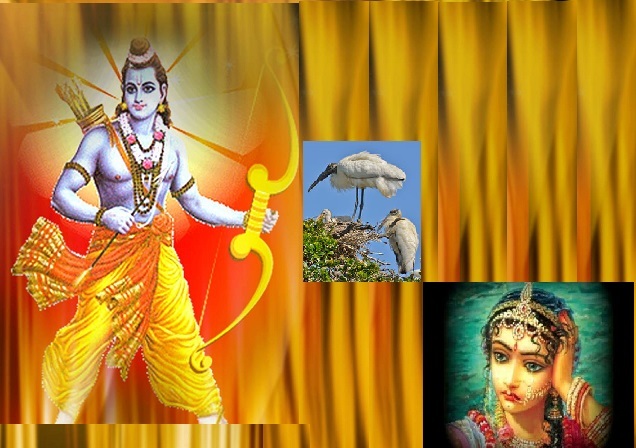 Now, AzhwAr is sending a messenger after the brahmAsthram [the ultimate weapon of SaraNAgathi] itself failed – it is not known if AzhwAr has acted in knowledge or plain desire; we cannot say AzhwAr is ignorant since he effortlessly sang pAsurams on emperumAn who was given up by Sruthi (vEdham) itself saying in thaiththirIya upanishath “yathO vAchO nivarthanthE” (the speech returned unable to measure bhagavAn‘s qualities); but since he is falling at the feet of birds, we cannot say that he is knowledgeable. So what does this mean? AzhwAr‘s act is in desire which is an effect of [real] knowledge. The effect of true knowledge is said to be detachment towards aspects other than emperumAn. And the result of such knowledge is desire towards emperumAn. It is said in sthOthra rathnam 1 “gyAna vairAgya rASayE” (collection of knowledge and detachment). Now, when AzhwAr sets out to send a messenger, he is not seeking an aindhra vyAkaraNa paNditha (hanuman is well known for his expansive knowledge and communication abilities). Does this imply that AzhwAr is greater than pirAtti (SrI mahAlakshmi) herself? Yes – that can also be said. sIthAp pirAtti’s state was based on her experience with SrI rAma only. But AzhwAr has the greatness of seeking to enjoy both pirAtti and perumAL. Due to such emperumAn [and pirAtti] her anguish is also more than sIthAp pirAtti’s anguish. Since for parAnguSa nAyaki there is no restriction of responding to emperumAn‘s messenger only [as in the case of sIthA] due to rAvaNa’s control of lankA, parAnguSa nAyaki just sends whoever she sees as the messenger. Those in separation generally seek neydhal (seashore) region [this is explained in thamizh literature]; thiruvallavAzh, thiruvaNvaNdUr etc are coastal regions. Those who send messenger, will see certain qualities in their beloved consorts; those are – having the knowledge to recognize the anguish of the other person, having the compassion and care to reach out after knowing about the anguish, and having the ability to reach out; for the one (emperumAn) who is sent messenger by parAnguSa nAyaki, there is no lacking in such qualities. For knowledge, he is capable of educating even great sages like vaSishta who taught him as said in SrI rAmAyaNam bAla kANdam 1.12 “gyAna sampanna:” (well endowed with knowledge); for compassion, he is said as in SrI rAmAyaNam ayOdhyA kANdam 21.6 “ripUNAmapi vathsala:” (one who is loving towards enemies too) and is as said in SrI rAmAyaNam kishkinthA kANdam 23.24 “samjAthapAshpa:” (with tears in eyes); for power/ability he is even praised by the enemies as said in SrI rAmAyaNam yudhdha kANdam 16.6 “ranjanIyasyavikramamai:” (one who pleases [others] with his valour). Now, a nAyaka (leader) is some one who is endowed with knowledge, completeness, discipline and conduct. The reason for the lack of arrival of emperumAn who is with such qualities is – due to the presence of many devotees in thiruvaNvaNdUr, he focussed on them and forgot about parAnguSa nAyaki; while engaged in protection he is as said in mAlathI mAdhava play “asmithAnyabhAvam” (forgets everything else); hence she thought if she informed him about her anguish, he will come. When informing to bhagavAn, there is no one who has greater grief than she. She cannot herself go and inform him, and her relatives are more anguished than herself; so, she needs some one who can reach upto him; she then notices the birds in her vicinity, thinks “they are capable of fulfilling my desire, just due to the relationship with her which came about due to residing in the same place”, falls at their feet and sends them [to emperumAn]. Everytime while mercifully explaining this decad, nanjIyar mercifully tells “Though krishNa was with pANdavas for their sake and was being with them all along, they suffered anguish; AzhwAr too is going through same anguish; they suffered being bewildered that there are some righteous means [instead of fully following emperumAn], but AzhwAr does not even have such bewilderment and yet why should he suffer”. parAnguSa nAyaki’s state is as said by dhraupadhi in mahAbhAratham udhyOga parvam “sAham kESagraham prApthA – thvayi jIvathya prabhO” (Oh lord krishNa! Even while you were alive, I was dragged by my hair and with great anguish reached the assembly where pANdavas were present). It was great danger where she could not be protected by her husbands who are fake protectors and herself – she was told before as in mahAbhAratham udhyOga parvam “mahathyApathi samprApthE smarthavyO bhagavAn hari:” (when you are in great danger, remember lord hari). bhagavAn – Is he not complete [bhagavAn means one who is complete in all auspicious qualities]! parASara rishi thinks incomplete individuals cannot accomplish the tasks. hari: – she surrendered unto emperumAn who is naturally inclined towards eliminating the enemies of his devotees. While Sakthi is already part of the six qualities such as gyAna etc which are explained in the term “bhagavAn“, hari: (one who has Sakthi to eliminate the enemies of the devotees) is explicitly mentioned in this SlOkam to highlight that the Sakthi (power/ability) is natural for emperumAn unlike others who occassionally acquire such quality. This entry was posted in thiruvAimozhi, thiruvAimozhi 6th centum on October 8, 2017 by Sarathy Thothathri.